Back in the day, the term “action figure” had not yet been coined, so there was no stigma to having boys play with “dolls”. When Hasbro coined the term “action figure” for the G.I.Joe line, the tide started to turn. Mego started producing their lines of figures in 1971 and was caught between these two frames of mind. So ads from the time often state “dolls”, yet others seem to dance around it. It is always fun to see what they are called: “Collectible Miniatures”, “Super Figures”, ect. Mego was a brilliant company. Instead of creating a line to just mimic G.I.Joe, they got licensed properties that kids are already familiar with and wanted to create new adventures for. Then, in order to save production costs, they release the figures reusing body parts from other lines and really the only new parts they needed to create for each figure was the head and the clothing. What was a cost saving trick turned into a kid’s wonderland. Figures were the same size and all cloths and accessories could be interchanged. I could have Captain Kirk beam down to the Planet of the Apes. Then, with help from Superman and Tarzan, defeat the damned, dirtiest ape of them all, King Kong! 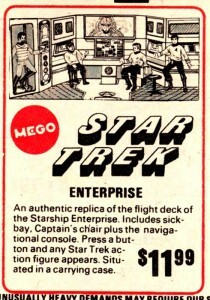 For your enjoyment, here are a few advertisements for Mego’s Star Trek line. 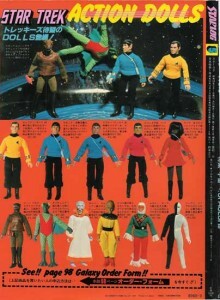 Though the figures came out around the time of the Animated Series, they mostly borrow from the live action series. The crew looks really good, with the classic phasers and uniforms. Aliens also look good, but there are some liberties. I especially like the Gorn, labeled as “Half Man, Half Beast”. 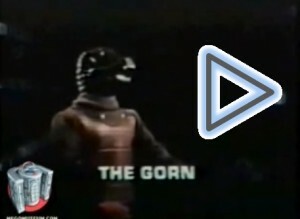 The Gorn was also made from the head of The Lizard (Spider-Man villian) and the clothes of a Klingon. Thus, looking nothing like the Gorn we know. Perhaps this was the first Gorn sub-species we will learn later from comics, video games, and Enterprise episodes. Then, there is the Neptunian who was never in any episode of Trek (Live Action or Animated). I guess the thought was to borrow from myth (similar to Romulus, Remus, Vulcan, etc), so they just made up an aquatic species and named it after Neptune. The figure is actually awesome and I wish someone who grew up with the toys would try and create a comic story with them in it. Who would not want Pine Era Kirk fighting that in an Ongoing issue? 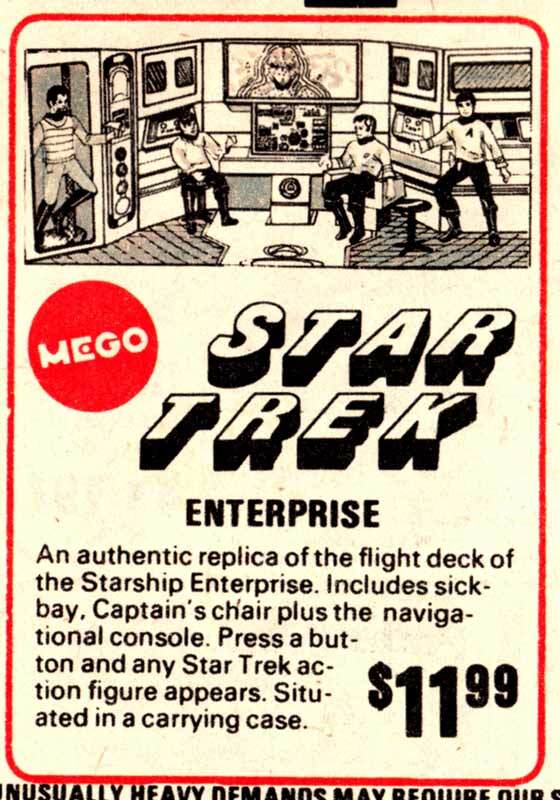 Mego also did a line based on Star Trek The Motion Picture. That will have to be for another post, because it too had some great ads. All in all, it would have been good to collect these. I got my hands on a few as a child, so I know how much fun they were. Now they have released most of them, so you can find them from time to time at your local Toys R Us (or any online toy shop). Great post! I love the Mego “dolls” and I was just old enough to play with them back when they came out all those years ago. In fact, some of my most precious Star Trek memories are Mego related. Also, good to see the website updated! We are trying to get back into updating the website regularly. We will try to have weekly themed posts, so please email us with any suggestions.